In this March 14, 2012, file photo, former Illinois Gov. Rod Blagojevich speaks to the media outside his home in Chicago as his wife, Patti, wipes away tears a day before he was to report to a prison after his conviction on corruption charges. On Monday, April 16, 2018, the U.S. Supreme Court rejected an appeal and let stand the convictions and 14-year prison term that Blagojevich is serving. He&#039;s scheduled to be released in 2024. Illinois politics has a bit of a reputation for corruption. In the last fifty years we’ve had four governors go to prison for everything from racketeering, to bribery, to bank fraud. Today, WBEZ is tackling the story of former Governor Rod Blagojevich's rise and fall in a new podcast called Public Official A. The first two episodes have been released and can be found on Apple podcasts or on WBEZ’s website. WBEZ reporter and Public Official A podcast host Dave McKinney joins us in our new Chicago studio space. “I think he needed my father to break in, you know what I’m saying? 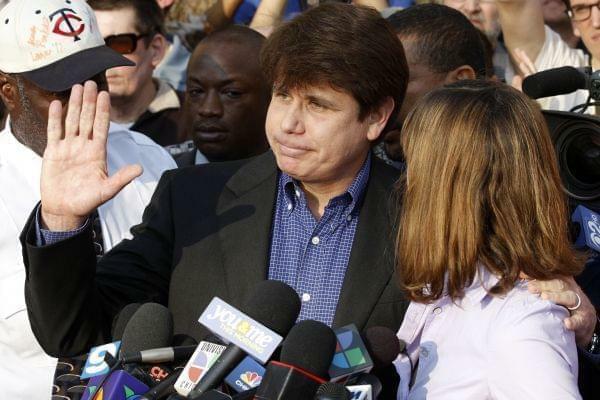 Because Chicago’s just that way… It almost becomes a family business,” says Patti Blagojevich. House Speaker Mike Madigan has been involved in Illinois politics for half a century. He’s also led Illinois’ Democratic Party for decades. And through all his many years as one of, if not the, most powerful politicians in the state, Speaker Madigan has survived nearly every political challenge that has come his way. However, last Fall the Speaker sat down for nearly five hours to give a sworn deposition. He’s been sued by Jason Gonzales who ran against him in a primary race and says Madigan put sham candidates on the ballot. We know about the deposition because the Chicago Tribune has a copy of it. We're joined by longtime investigative reporter Ray Long for more. @RayLong says Speaker Madigan believes that Jason Gonzales - who ran against him in a primary race, and is suing him - is backed Bruce Rauner who has been his nemesis for years. 20 years feels like an eternity in the life of the internet. Back then, a Microsoft researcher named Victor Bahl was working on something that most of us take for granted now: the first Wi-Fi hotspot in a public place. Since those days, the internet has changed in so many different ways and we rely on it unconsciously, even as the systems behind it get more and more complicated. Victor has continued to work on understanding and improving these systems over the years. Today, we speak to Victor as he prepares to give a speech at a research conference for University of Illinois students. He’s a distinguished scientist and director of Microsoft’s Mobile Networking And Research Group. "The reality is that more than 4 billion people around the world don't have internet." @SuperBahl says access to good information leads to good decisions and wifi should be a basic human right.